A big part of the reason why so many British people voted to leave the EU in the 2016 referendum was the fact that they viewed (and very likely still view) the bloc as no more than a trading area — the “common market” as many people in the UK still call it. They had no respect for its other function, because they did not understand it. The political aspect of the EU, with its common rules, regulations and protections granted to consumers, workers, etc., were (and still are) seen by many in the UK as “shackles” and “dictatorial” – despite the fact that many of these rules, regulations and protections have been designed with a substantial contribution from British experts and/or politicians. Of course, the toxic tabloid newspapers that pumped lies and deceit about the EU for decades have a big role to play in all this. But the internet is not such a recent innovation, and people who want to inform themselves about any topic can find the facts by researching the topic online. Besides, there are some balancing newspapers in the UK, offering the other side of the story. By contrast, across the Channel, many continental Europeans accept and even embrace the political side of the EU, the “ever-closer union” that the British fear, because they appreciate more the advantages that it brings, such as unity on what is otherwise a very divided continent, strength in numbers, and peace. But if we look at what is similar on the two sides of the Channel, we’ll see another reason why so many people in the UK voted to leave the EU. It’s also one of the main reasons why they were so easily manipulated by unscrupulous politicians who did not offer any real solutions, but took advantage of these people’s plight to achieve their goal of taking Britain out of the EU. 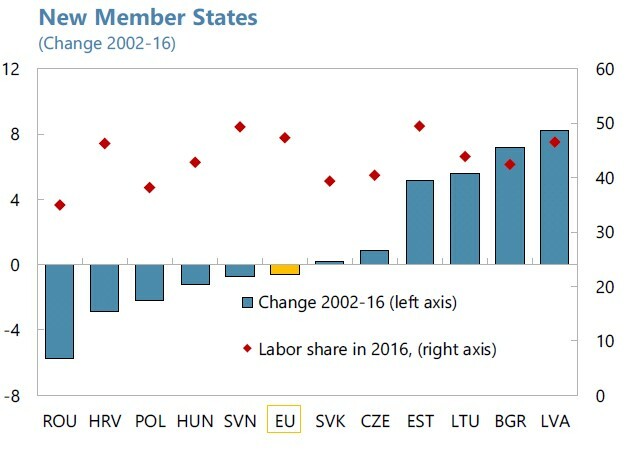 The ratio of wages to national income, otherwise known as the labour share, has been in decline in the EU over the past two decades, a research paper recently published by the International Monetary Fund (IMF) shows. Of course, this is nothing new to a lot of the Brexit voters, who have been blaming their lack of financial progress on “Eastern European immigrants stealing their jobs”. … but it also happens in some of the developing ones, the Eastern European countries that joined the EU in the first decade of the century. With their wealth diminishing, the left-behind people are increasingly unhappy. Brexit can be said to be the passive-aggressive version of France’s “yellow vests” violent protests – generally, in Britain people seem to prefer “hidden” violence to the open kind, so the voting booth offered them the ideal means of expressing it. Those whose labour share is diminishing are workers without a university degree, those with few qualifications, manual labourers and those in sectors like goods production, where manufacturing has been moved to lower-cost countries, generally in Asia. 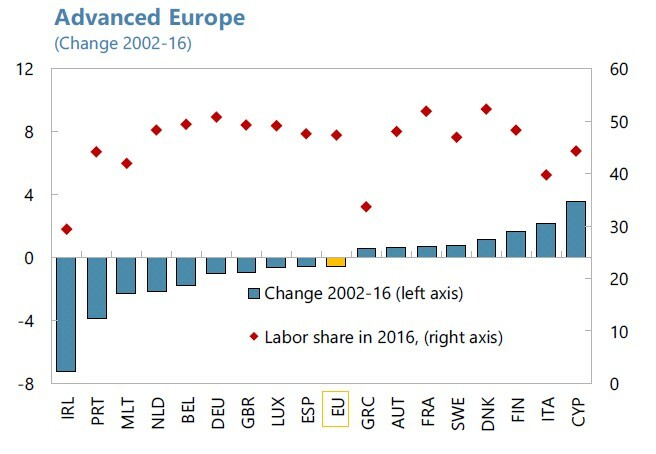 In rich countries like Germany, the Netherlands and the UK, the fall in the wages-to-GDP ratio is also caused by the erosion of worker rights, the shift towards more precarious employment like part-time contracts, self-employment or zero-hours contracts. This has a lot to do with the decline of trade unions, which has reduced workers’ bargaining power. This is not something that Brexit will solve. In fact, it will only make it worse. The amount of time spent on negotiating Britain’s EU withdrawal could have been spent on finding solutions to this problem. Instead, a disorderly UK exit from the EU (or even an orderly one, but to a lesser degree) will deepen this social and economic rift, both in Britain and in the rest of Europe.